Say goodbye to V-sync, uninstall your bootleg copy of FRAPS and reconsider picking up one of Nvidia's Shield handhelds. During its "The Way It's Meant To Be Played" event in Montreal today, Nvidia unveiled a trio of technologies that could make its video cards an indispensable part of any PC gaming rig. The coolest announcement, from a purely hardware standpoint, is G-sync, a method of reducing screen tearing and artifacts that will finally allow players to break the chains of V-sync. V-sync works by lining up the output of a video card with the refresh rate of the monitor — generally 60Hz, a standard that was put in place for televisions in the 1940s. By limiting the framerate of a game to a multiple of 60, the output lines up perfectly with the monitor, eliminating tearing and artifacts. The problem with V-sync is that it's limiting the power of a graphics card to suit the display. If you've got a card capable of running a game at a solid 100Hz, you either deal with tearing for fast response times, or lag things down to 60Hz and suffer a reduction. Screw that, says Nvidia's new G-SYNC tech. G-SYNC is a module that goes inside a monitor, effectively bending it to the will of the graphics card. Rather than refreshing at a fixed rate, the monitor begins a refresh cycle after every frame the GPU renders. 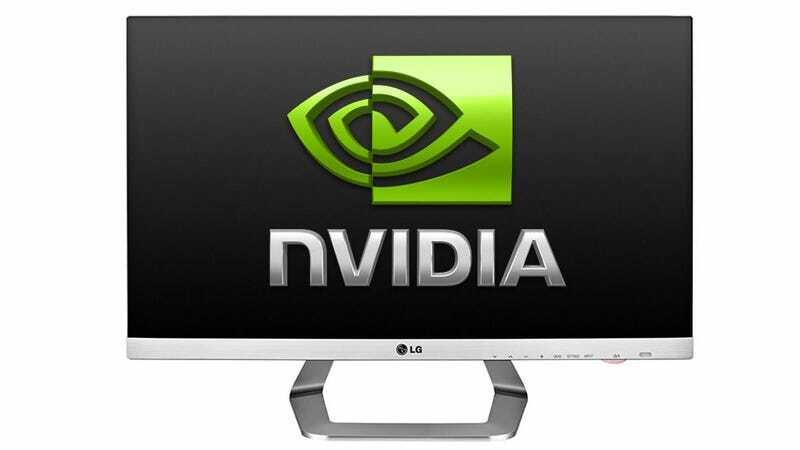 the monitor's refresh rate is set by the graphics card — no tearing, no stuttering. It'll be a while before we start seeing monitors with "G-SYNC Capable" stickers on the side of the box, but when they start showing up I've a feeling they'll sell like crazy buckets. Software PC game capture solutions generally take a big toll on a CPU already busy running a complicated piece of entertainment software. Hardware solutions are available, but they can run a couple hundred bucks, all for a device that's basically a CPU-independent H.264 encoder. Launching on October 28 with the 1.7 release of the Nvidia Experience, ShadowPlay is a video capture application that utilizes the onboard encoder in every GTX GPU, effectively turning it into a video capture card. Nice. ShadowPlay has two modes. The first, shadow mode, automatically maintains a buffer of up to 20 minutes of gameplay footage at 1920x1080, ready to be stopped and clipped at any time. The second is a standard, hotkey activated capture. Down the line, Nvidia plans to add Twitch streaming to the mix as well. With both next-generation game consoles ready to record and share footage right out of the box, there's no reason PCs shouldn't have the same capability. Well, now they will. October 28 sees the launch of GameStream, the official name for the Shield streaming technology, officially coming out of beta. The updated service now streams more than 50 popular games, including upcoming titles like Batman: Arkham City and Assassin's Creed IV: Black Flag, across a wireless connection without noticeable lag at 60 frames-per-second. ASUS, Buffalo, D-Link, and NETGEAR are all readying wireless routers marked "GameStream Ready" for release, and enhanced onscreen controls will mean we'll no longer have to walk over to our computers to deal with Steam dialog boxes. Plug your Shield into your television via HDMI, connect a Bluetooth controller like the Nyko PlayPad Pro, and stream PC games to your television from your GeForce GTX gaming PC. Okay, so we're connecting a controller to a controller in order to play wirelessly. It's a bit convoluted, but it's also a cheap-ish PC streaming solution, the sort of thing Valve's recently been chatting up a lot. Plus, since the Shield uses most of the same innards as Nvidia's Tegra tablet platform, this functionality could easily be ported to any Tegra 4-powered device in the future. GameStream won't be limited to yuor own PC for long — eventually it will support gaming through Nvidia's GRID cloud gaming service as well. With the PlayStation 4 and Xbox One coming out next month, some PC gamers might be worried about their PC's capabilities as compared to the next-generation consoles. If anything, Nvidia's announcements today help reinforce that which has always been the case — there's no gaming platform as versatile as the good old PC.